Origin: Brazil, naturalized in southern California, Hawaii, and south Florida. Landscape Use: Small shade tree, screen, background. The poor man's landscape tree of choice when spending money on landscape is one's last or least interest. Form & Character: Evergreen tree, open spreading canopy, stiff and brittle with a random matrix of dense branches that criss-cross and spread 'all over the place'. Growth Habit: Moderately fast to 20 to 30 feet with often greater spread. Foliage/Texture: Aromatic (pepper), odd pinnately compound leaves, leaflets in 5 to 13 pairs, oblong to 2.5 inches, veins prominent; medium texture. Flowers & Fruits: Showy white green flowers in terminal panicles; fruits clustered, pinkish rose colored, small (<1/4 in.) and rounded, aromatic like foliage. Seasonal Color: Sublime - flowers in May, followed by pinkish rose fruit fruit during fall and winter. Soil: Well drained. Less prone than S. molle to chlorosis in alkaline desert soils. Pruning: Brazilian pepper tree will require significant and frequent pruning in most urbans settings either to train or to correct bad form. Eventually you'll want to chop it down and be done with it. In general, elevate the canopy base and rigorously train scaffold branch architecture to compensate for its real crummy branch topology. As such, one can expect that this hapless tree will need staking and training when young to cause an upright habit. Propagation: Brazilian pepper trees are easily propagated by seed. They will 'colonize' some in central Arizona in and around sources of water and moist soil. 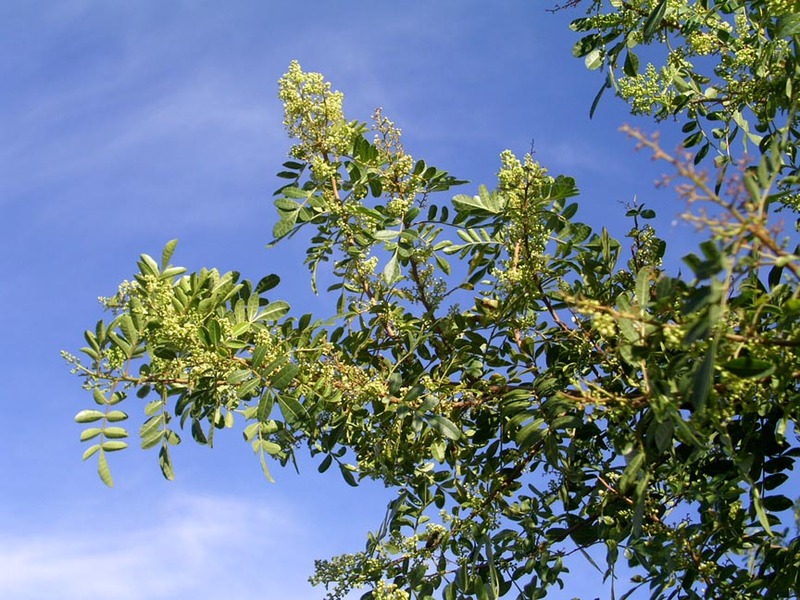 Braziliam pepper has vigorously naturalized in southern California, Hawaii and south Florida where it has become an invasive nuisance tree forming Brazilian pepper tree thickets. Additional comments: This is a high maintenance tree of questionable value in many landscape settings that frankly nursery operators can grow fast and sell quick. In Phoenix, drought tolerance makes it worthy of consideration for smaller spaces; however, it is weak wooded, prone to have an atrocious branching architecture, and reseeds with gusto. Personally, I've pulled enough seedlings from yardscapes in southern California as an entrepreneurial teenage boy to develop a true dislike for this invasive, aromatic doggy (Woof!! Woof!!) tree. 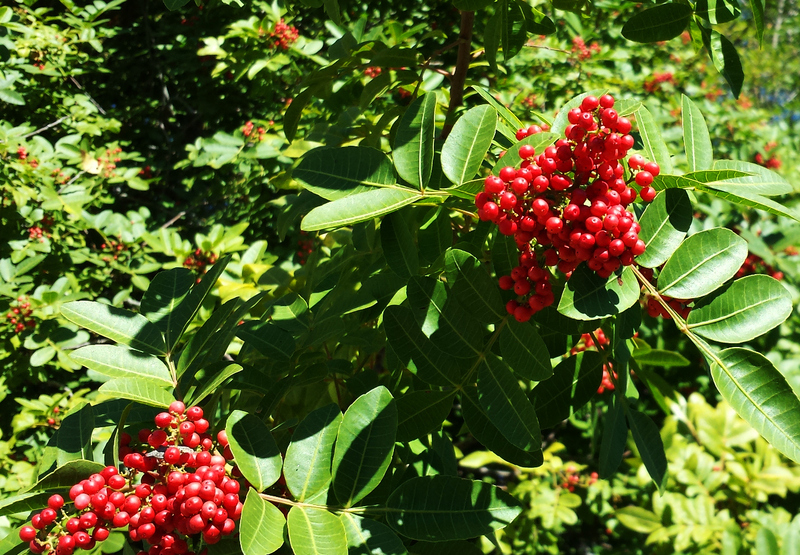 Or as one ecological web site fondly puts it, "Brazilian pepper tree is an aggressive pioneer species that quickly colonizes disturbed areas". Others appreciate it more for it's drought tolerance, evergreen habit, and relatively dense shade. Brazilian pepper produces irritant toxins that have an allelopathic effect inhibiting both germination and growth of plants around it. 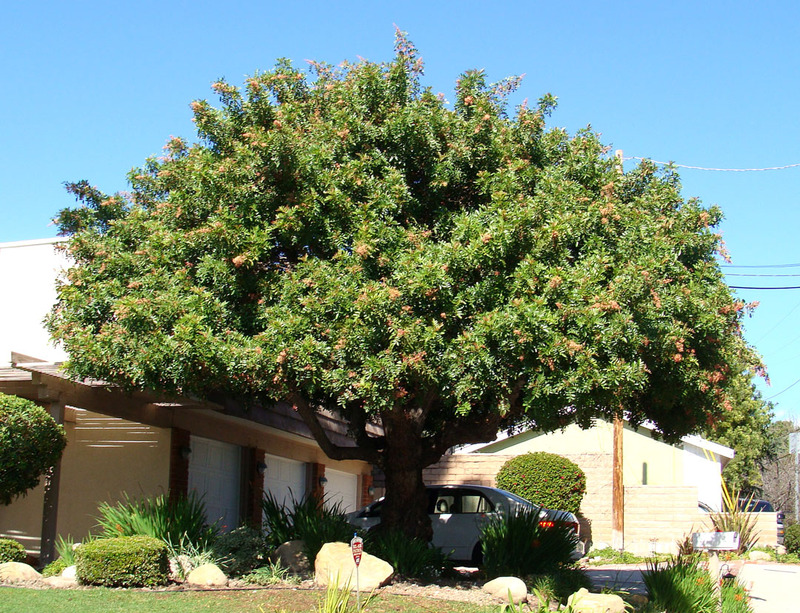 I have searched far and wide and have found only this Brazilian pepper tree in Woodland Hills, California that has looked good enough to photograph. I guess you get my point....this tree is a real landscape loser. It's one redeeming quality is that it produces fewer basal suckers than S. molle.